The Chatham Anglers (4-0) swept the Brewster Whitecaps to become East Division Champions for the first time since 2001. In the Championship Series, the A’s will face a familiar foe — the Wareham Gatemen (4-0). Read below for all the names, dates, trends and history pertinent to the upcoming series. 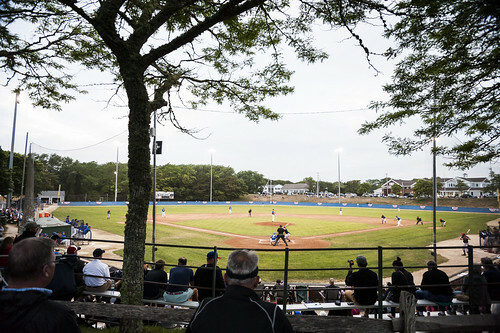 Veterans Field, the site of Game 2 of the CCBL Championship Series. Clem Spillane Field uses stone dust rather than clay to cover the infield. 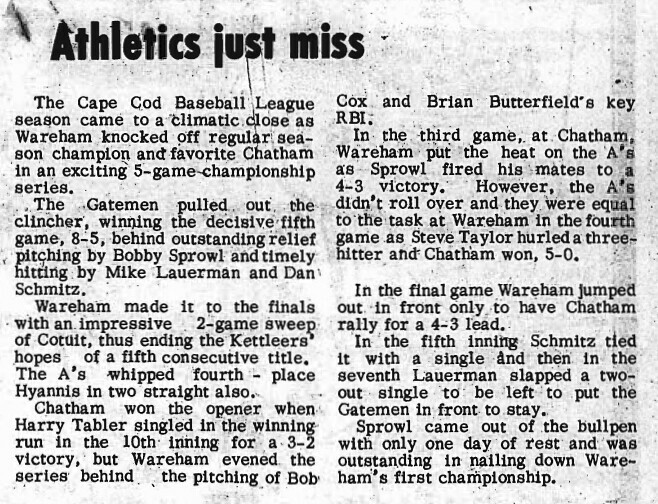 A three-game series that went down to the final pitch of game three, the 2001 CCBL Championship Series between Chatham and Wareham was a fiesty, close series. In Game 1, the A’s had a 3-2 lead in the fifth inning, but a four-run inning and two ejections changed the course of the game. The Gatemen tied the game when an errant throw on a bunt scored Mike Galloway (Central Michigan) and then took the lead when Dave Murphy (Baylor) scored on a groundout. With two outs and a runner on second, Matt Murton (Georgia Tech) hit a fly ball deep to the left field corner. Kris Cox (Mississippi) ranged over and, as he crossed into foul territory, saw the ball hit off his mitt and land in fair territory. 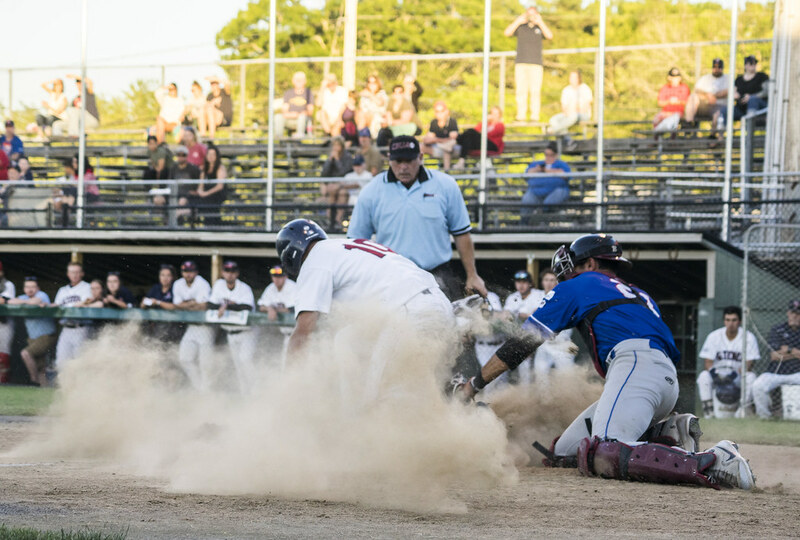 The umpires called it a fair ball, allowing the Gatemen to score another run. A’s manager John Schiffner was incredulous at the call and got ejected for arguing and shortstop Drew Meyer (South Carolina) was also tossed before the next at-bat. Wareham scored two more runs later in the game to win 8-3. Chatham won Game 2 of the series, 2-1. Wareham scored one run in the first to take an early lead. The A’s Bobby Malek (Michigan State) hit a second-inning home run to tie the game at one and then John Schneider (Delaware) knocked in the game-winning run later in the inning on an RBI single. Chatham would also muster one more baserunner in the game, but they had scored all the runs they needed to win the game. Game 3 went down to the last pitch. With the contest tied at three in the bottom of the ninth, Chatham’s Zane Carlson (Baylor) had Wareham’s Paul Henry (Ball State) in a 1-2 count. Henry swung and hit the ball of the end of the bat. The ball rolled slowly down the third base line, just fair. 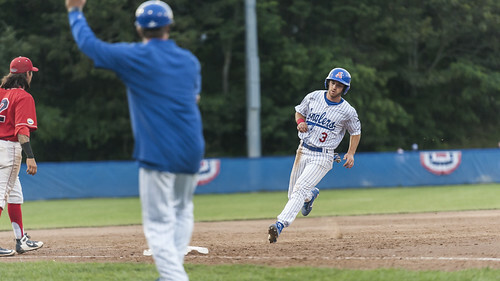 Carlson ran to retrieve the ball and make the throw to first, but as he picked up the ball, he slipped on the wet infield grass, allowing Keith Butler (Liberty) to score and give Wareham the 2001 CCBL title. For more on the 1998 CCBL Championship Series, read the feature on the 1998 Chatham A’s here. From Page 5 the September 2, 1976 edition of The Cape Cod Chronicle. 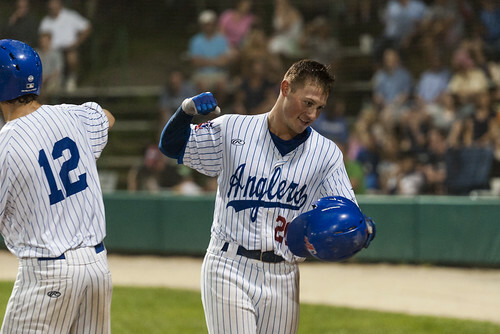 John Rave leads the Anglers in postseason batting average (.500). CF John Rave (Illinois State) — After recording three hits in Chatham’s two-game sweep in the EDS, Rave raked four hits — including a solo-home run in Game 1 — of the EDCS against Brewster. The Illinois native scored two of the A’s three runs in their Game 2 win. In the playoffs, Rave leads the team with a .500 batting average. 1B/DH/RHP Tristin English (Georgia Tech) — In Game 2 of the EDCS, English turned in his bat and first baseman’s mitt for a pitcher’s glove and almost single-handedly led the Anglers to their series-clinching win. English went 8.2 innings, allowing his only runs on a two-run round-tripper on the last pitch of his outing. While he will not pitch in the Championship Series, he will look to add to the three hits and two RBIs he has recorded in the playoffs so far. C/INF/OF Blake Sabol (Southern California) — Sabol’s aggression, both at the plate and on the basepaths, has directly led to runs this postseason. In the EDCS, he put the ball in play on the first pitch of his at-bat five times. Three of those instances resulted in a single, home run and ground-rule double. Sabol has swiped two bags and scored seven runs in Chatham’s four playoff games. OF Spencer Torkelson (Arizona State) — After a hitless Game 1 of the EDS, Torkelson has registered two hits in each of the Anglers’ last three games. In Game 1 of the EDCS, the California native whacked two long balls, including a three-run shot in the second inning to put the A’s up five. In Game 2, his RBI single on the fifth pitch of the game gave Chatham a lead it would never give up in a series-clinching win. RHP Austin Bergner (North Carolina) — Bergner, Chatham’s Game 1 starting pitcher of the Championship Series, has been one of the Anglers’ most consistent hurlers all regular season and into the postseason. In total, Bergner sports a 2.51 ERA. He helped lead the A’s to victory in Game 1 of the EDS against Harwich when he threw six innings, allowing two runs and striking out seven. LHP Jeff Belge (St. John’s) — Belge is slated to be Chatham’s Game 3 starter if the series requires a third game. The left-hander posted a solid start in Game 1 of the EDCS, tossing 4.1 innings and conceding two runs on five hits. Belge led the team in innings pitched (35.2) and ranked second in the league in strikeouts (46) during the regular season. RHP Kyle Hurt (Southern California) — Hurt made his first appearance in the playoffs in Game 2 of the EDCS and did his job as efficiently as possible. After English allowed a two-run homer with two outs in the bottom of the ninth, Hurt trotted out from the bullpen and struck out the next batter on three pitches to clinch the series. The right-hander is expected to appear in the closer role in the Championship Series. RHP Alek Manoah (West Virginia) — Despite Manoah’s six runs allowed in his last start, Chatham’s Game 2 victory against the Mariners in the EDS, he was an essential piece to the A’s triumph. After allowing five runs in the second inning, Manoah retired the side in three consecutive innings and ended his outing with 11 strikeouts. The 6’7” hurler is expected to start Game 2 of the Championship Series. OF Isaac Collins (Creighton) — Collins, Wareham’s leadoff batter, has recorded a hit in 12-straight games dating back to July 25. In the postseason, the switch-hitter has eight hits, two doubles, two triples and three RBI. During the regular season, Collins posted a .308 batting average with one homer and 13 RBI. CF Skyler Hunter (Purdue) — After batting .205 in the regular season, Hunter has taken off in the playoffs. The Oregon native has six hits in three postseason games, including three in Wareham’s 15-6 blowout over Cotuit in Game 2 of the WDS. Hunter hit just four extra-base hits in the regular season, all of which were doubles. 3B Austin Shenton (Florida International) — Shenton was one of the best players in the Cape League during the regular season and has only improved since the start of the postseason. The left-handed hitter has nine hits in 15 at-bats, including three home runs and a triple. In the regular season, Shenton ranked third in the league with a .349 batting average. RHP Ryan Garcia (UCLA) — Garcia, Wareham’s scheduled starter in Game 1 of the Championship Series, has been one of the top arms in the league all summer. In the regular season, he recorded a 1.28 ERA in seven appearances. Garcia has allowed no more than one run and five hits in any of his outings. RHP Derek West (Pittsburgh) — West pitched in Game 2 of the WDS against the Kettleers and did not have a desirable outing. The right-hander allowed four runs on five hits while walking four in 3.2 frames of work. West logged a 1.10 ERA in the regular season, however, as he allowed just two total runs in five appearances. During the first three Championship Series meetings between Chatham and Wareham, each team had at least one major league player on the team. Here is a list of every MLB player who played on Chatham or Wareham during the three previous championship meetings. Spencer Torkelson’s had three-straight multi-hit games. 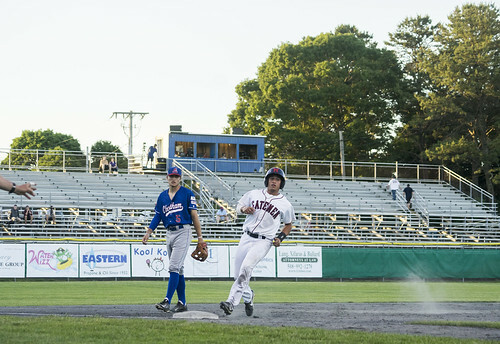 During the regular season, the Anglers failed to win any of their four matchups against the Gatemen. In the four contests, Chatham was outscored 34-12. Of the eight active A’s players who appeared in at least three games against Wareham, only two — English and Greg Jones (UNC Wilmington) — posted above a .230 batting average. English, who will act as a position player in the series after pitching in Game 2 of the EDCS, is 5-for-11 against the Gatemen this season. While Bergner, Chatham’s Game 1 starting pitcher, has not thrown against Wareham this season, scheduled Game 2 starter Alek Manoah has. In the first game of the season on June 12, Manoah lasted four innings, conceded three runs on two hits in a 12-4 loss. While Wareham’s pitching and defense were solid in its four games against Chatham, its offense is what propelled it to such dominance. Seven active Gatemen players — Shenton, Collins, Ryan Kreidler (UCLA), Jeremy Ydens (UCLA), Oliver Dunn (Utah) and Lael Lockhart Jr. (Houston) — have posted higher than a .380 batting average against the A’s this season. Those seven players have combined to go 24-for-55 with a home run and 14 RBI against the Chatham staff.